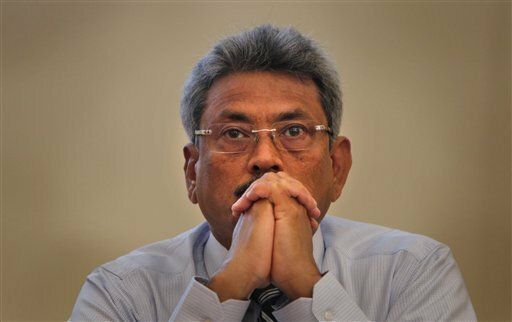 Gotabaya Rajapaksa was served with notice of two separate civil lawsuits against him in California on Sunday evening, in relation to atrocity crimes he allegedly committed while Sri Lankan Secretary of Defense. Rajapaksa, who oversaw a military offensive that massacred tens of thousands of Tamils, was formally served notice of the lawsuits at a Trader Joe’s parking lot in Pasadena, California. The first civil lawsuit was filed by the International Truth and Justice Project and the American law firm Hausfield on behalf of Tamil torture survivor Roy Samathanam. Samathanam was physically and psychologically tortured after being detained in Colombo in September 2007 by the Terrorism Investigation Department of the police (TID). Samathanam was only released in August 2010 after signing a false confession and accepting a plea deal. He won a case against the Sri Lankan government at the UN Committee Against Torture but the Sri Lankan government did not comply with the order for compensation. Notice was also served at the same time in a seperate case filed by another organisation on behalf of assassinated Sri Lankan journalist Lasantha Wickrematunga. The second lawsuit was filed by Ahimsa Wickrematunge seeking damages from Rajapaksa for instigating and authorizing the extrajudicial killing of her father, who was the former Editor of the Sunday Leader newspaper. See more from the ITJP here. Rajapaksa has been touted as a potential candidate for this year's Sri Lankan presidential elections. In the past he has defended the military’s bombing of hospitals, and even stands accused of giving direct orders to execute surrendering Tamils. In 2014, Ryan Goodman, Professor of Law and Co-Chair of the Center for Human Rights and Global Justice at New York University School of Law called on the United States to prosecute Gotabhaya Rajapaksa for war crimes, highlighting various laws that the administration may be able to pursue charges against the former defence secretary. Goodman stated that Rajapaksa, a US citizen, could face charges under the War Crimes Act of 1996, as well as coming under investigation from other agencies for immigration fraud and possible tax evasion.